It’s no secret that LinkedIn is one of the fastest growing networking sites in the world. Professionals and companies have joined the site in throngs since it was first founded in 2003. It’s estimated that as of February 2012, there were 161 million users on the site. Recruiters, who use the site to find fresh talent to place in available positions, heavily rely upon LinkedIn. Below, you will find some tips from 3coast recruiters on how to maximize your profile and help you land your next job. 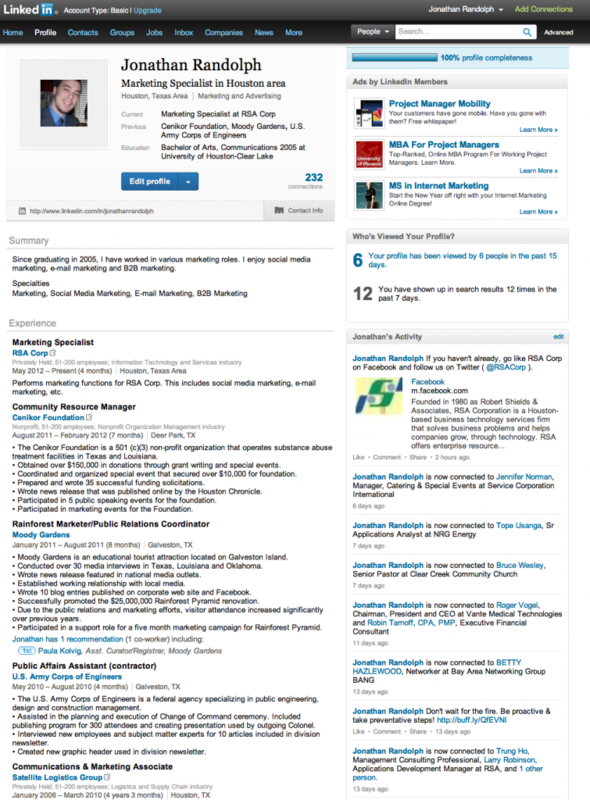 Treat your profile like it’s an online resume that anyone can view. Make sure that your information is as detailed and accurate as possible. Include the months that you started and stopped each position. Your profile should include a professional-sounding e-mail address, headline, summary, experience, educational background and skills. If you have any extra training or military experience, be sure to include that too. It’s not the best idea to have an incomplete profile. Doing so will ensure that recruiters and hiring managers skip right over you and move to another candidate with a more detailed profile. This is often the first thing a company or recruiters will see in their search. This image should be a full headshot with pleasant and confident facial expressions. Including your photo not only makes your profile more personable, it also makes your name and credentials more memorable. Refrain from including an inappropriate photo. Don’t use the photo you took at the bar on your birthday. This will definitely send the wrong message to recruiters and possible employers. If you incorporate keywords within your profile, it will make it easier for recruiters to find it. Use well-rounded keywords to describe your strengths throughout your profile and include them in the headline, summary and experience sections as well. Use weak keywords and phrases that recruiters have seen thousands of times. One of the most overused phrases is “extensive experience”. Do yourself a favor and don’t ever use that. Creating your own personal URL helps you become more “findable”. It will also improve your profile’s Google search ranking. Doing this also makes it easier to share your LinkedIn URL on resumes, e-mail signatures, etc. Don’t: Overlook this step. It’s done quickly and easily and will benefit your profile greatly. A surefire way to get bypassed for a position is to have a profile chock full of grammar and spelling mistakes. Find a good editor (or two) to go over your profile to eliminate these mistakes. A profile with these errors may cause recruiters to conclude that you’re careless, or worse. Don’t: Have spelling or grammar errors ANYWHERE in your profile. Recruiters and hiring managers read these. Recommendations provide more context around the experience and accomplishments listed in your profile. These statements give recruiters and managers a sense of what it is like to work with you and speaks a lot louder than just your resume. Don’t: Ask everyone for recommendations. Make sure that the people you ask are familiar with you and your work. Also, don’t ignore requests for a recommendation. If someone you don’t know very well asks for one, send a polite message explaining that you don’t know him or her well enough and don’t feel comfortable providing a recommendation at this time. We hope that these tips prove to be helpful. LinkedIn is an extremely valuable resource, so we encourage you to keep learning and improving your profile. Feel free to follow 3coast and join the 3coast group on LinkedIn.